How do airplanes work? Why does a wing change shape on takeoff and landing? This site was built for middle school to college students. The Kid's Page explains how airplanes and jet engines work. This site was built for younger students. The Wright Way will show you the basic math and physics that led to the invention of the airplane by the Wright Brothers. This site was built for middle to high school students. + Movies featuring "Orville and Wilbur Wright"
How do jet engines work? Why are there different kinds of jet engines? This site was built for high school and college students. The Aerodynamics of Baseball will show you the basic math and physics that govern the flight of a hit ball and a curve ball. This site was built for middle school and high school students. The Aerodynamics of Soccer will show you the basic math and physics that govern the flight of a soccer ball. This site was built for middle school to high school students. The Beginner's Guide to Model Rockets will show you the basic math and physics that govern the design and flight of all types of rockets. This site was built for high school and college students. The Water Rockets site will show you the basics for designing and flying water or bottle rockets. This site was built for younger students and their teachers. The Beginner's Guide to Kites will show you the basic math and physics that govern the design and flight of kites. This site was built for middle school to college students. What is a wind tunnel? 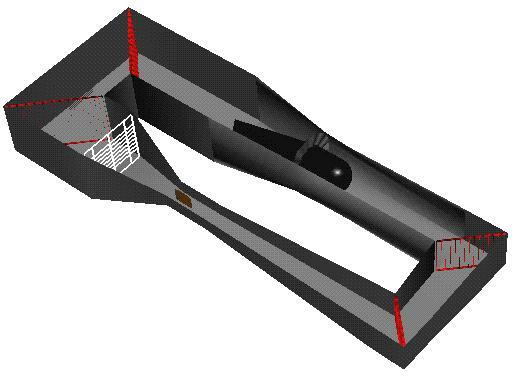 How do engineers use wind tunnels? This site was built for middle school to college students. What is a shock wave? What happens in supersonic flight? This site was built for high school and college students. What are the unique problems of hypersonic flow? This site was built for college students. In the 21st century, airplanes are a normal part of everyday life. We see them fly over, or read about them, or see them on television. Most of us have traveled on an airplane, or we know someone who has. Do you ever wonder how airplanes fly? What causes the lift that gets the airplane off the runway? How does a pilot control the movement of the airplane? How did the Wright Brothers invent the airplane? Why are the engines on an airliner different from the engines on a fighter plane? How does aerodynamics affect the flight of a baseball, soccer ball, model rocket or kite? The information at this site is provided by the NASA Glenn Educational Programs Office (EPO) to give you a better understanding of how aircraft and aerodynamics work. The web site is divided into Beginner's Guides about a single topic. There is an index for each guide that lists pages within the guide. Each page describes a single subject related to the topic and every page has the same format. At the top of the page is a slide or graphic that illustrates the subject. Below the slide is a detailed description of the physics and math related to the subject of the slide. There are many hyperlinks and references to other pages at the site where you can find additional information. At the bottom of each page are some navigation links with colored buttons to take you back to the appropriate index. On many pages we have interactive simulator computer programs, calculators, computer animations, and movies that demonstrate the physics and math of the topic. You can download your own copy of any of these programs or animations by following the directions on the web page that contains the program. The Beginner's Guide to Aeronautics has been on the web for over a dozen years. During that time, NASA projects have come and gone and the intended audience has variously changed from high school students to college students and back to middle school students. So there is a wide breadth of information here at the site. The mathematics alone spans the range from calculating the area of a rectangular wing to using calculus to derive the ideal rocket equation. We are currently grouping and tagging the web pages by grade level so that teachers can more easily find grade-appropriate activities. This may result in multiple versions of the same page. Much of the material in the Beginnner's Guides to Aerodynamics and Propulsion was originially developed for NASA's Learning Technologies Project (LTP). The Beginner's Guide to Model Rocketry was developed for the Exploration Systems Misssion Directorate (ESMD). Re-Living Wright Way was developed as part of NASA's Centennial of Flight Celebration. The Kid's Page was developed under the Ultra Efficient Engine Technology (UEET) Project at NASA Glenn. The Beginner's Guides to Hypersonic and Wind Tunnels were built for the Fundamental Aero program (FAP) of the Aeronautics Reasearch Mission Directorate (ARMD). Aerodynamics of Soccer was built for NASA HQ during the 2010 Summer of Innovation Project. Elementary and middle school teachers at two workshops sponsored by LTP in 1996 and 1997. Middle and secondary school teachers at four workshops cosponsored by the LTP and the Ohio Space Grant Consortium in 1998 and 1999. Pre-service middle and secondary school teachers from the University of Akron, Akron, Ohio, in 2000. At each Beginner's Guide index, there is a link to an index of the teacher-generated activities related to the topic. You can also access the activities by clicking on buttons at the bottom of a web page. As an aid to teachers, we have organized the activities by grade level (K-6, 4-6, 6-8, 9-12, 11-12) using color-coded buttons. The web site was prepared to provide background information on basic aerodynamics and propulsion for math and science teachers, students, and life-long learners. We have intentionally organized the Beginner's Guides to mirror the unstructured nature of the world wide web. There are many pages here connected to one another through hyperlinks. You can then navigate through the links based on your own interest and inquiry. However, if you prefer a more structured approach, you can also take one of our Guided Tours through the site. Each tour provides a sequence of pages dealing with some aspect of aerodynamics or propulsion. We have also produced many Power Point Presentations on the various topics using the slides from the Beginner's Guides. You are encouraged to download and modify these presentations for your own use. You can download a copy of any slide on any page by using a right click and "Save As..". All of this information was developed in the public domain. We would like to know if you are using the Beginner's Guides or any of the interactive computer programs. We continue to upgrade, improve, and extend the programs based on user comments. Please send your comments to Tom Benson using the link at the bottom of any page. NOTICE --- The site has been developed to support Section 508 of the Rehabilitation Act. Many of the pages contain mathematical equations which have been produced graphically and which are too long or complex to provide in an "ALT" tag. For these pages, we have retained the non-compliant graphic at the top of the page and have provided a compliant text version of the equations in the body of the page. In many cases, because of the use of Greek fonts in the graphics, the purely English text version of the equations is slightly different than the graphic version. The differences are noted in the text.